As wary CD-7 Voters decide which Candidate is the BEST CHOICE to preserve their sensitive communal environment, its obvious AGAIN, that City Hall Insider (and Sierra Club National Board of Directors Secretary) Susana Reyes, is more concern with maintaining an "Establishment Machine (with Chevron support) Hold" on the Northeast San Fernando Valley Council District ........, than conserving its unique ecological character. 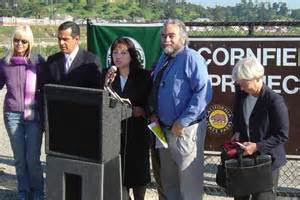 Then Sierra Club Angeles Chapter Political Chairperson Susana Reyes announcing the Environmental Organization's Endorsement of Antonio Villaraigosa for Mayor in 2005. BIG OIL MONICA embellishing past and CURRENT Chevron support. ** Blogger's Notes: We PROUDLY bring you this 2017 CD-7 Runoff Moment of ENVIRONMENTAL HYPOCRISY via the, NOW Sierra Club National Board of Directors Secretary (and DWP HR Director/Crony of Mayor Eric Garcetti) Susana Reyes. The noted Los Angeles County Political Director of the Angeles Chapter of the supposed-Environmental Organization, has AGAIN shown, its more important to preserve the "Blue Establishment Machine Stewardship" of a Communal Habitat ............, over the Endorsement of a Candidate thats best suited to protecting the unique Open Space of CD-7-----Scott Johnson. What's Bloggin Trending for Post-Easter Monday?